The grazing movement is, both literally and figuratively, a grass-roots movement. Many livestock producers in the northern USA have recently moved from predominantly confinement feeding systems to grazing systems. Most of them use some form of management-intensive rotational grazing in which livestock are periodically rotated from one paddock to another, allowing the plants in each paddock a rest period to recover from grazing. The beginnings of the grazing movement originated with livestock producers and support groups, adapting routine methods and technology (Voisin, 1959) to their personal situations and needs. Once the movement became more visible and gained momentum, research interests grew and several research institutions, including the University of Wisconsin, began to support the movement. Management-intensive rotational grazing systems in the northern USA are grass-based systems. They can be based on naturalized grasses, those that naturally appear if crop fields are allowed to revert to pastures. The most dominant grasses in these systems are Kentucky bluegrass (Poa pratensis), quackgrass (Elytrigia repens), and smooth bromegrass (Bromus inermis). Cropland can also be converted into productive pasture by renovation and reseeding. Orchardgrass (Dactylis glomerata), reed canarygrass (Phalaris arundinacea), tall fescue (Festuca arundinacea), meadow fescue (Festuca pratensis), festulolium (Festulolium braunii), perennial ryegrass (Lolium perenne), Italian ryegrass (Lolium multiflorum), timothy (Phleum pratense), are commonly used grasses in improved pastures. The best grass species for a pasture will vary with location, climate, soil type, moisture conditions, and grazing regime. Some of the grasses above are very long-lived perennials that can last forever in the proper environment and with proper management. Others can only be considered to be short-term components to pastures, particularly for locations with relatively cold winters. For some species, there is a huge amount of variability among varieties, with some varieties being more suitable for grazing than others. The purpose of this paper is to describe some recent research aimed at developing better grasses for management-intensive rotational grazing systems. We began working on the ryegrasses in the early 1980s, quickly realizing that winter survival under Wisconsin conditions was the biggest issue in the promotion and use of any ryegrasses. The big European companies would routinely send their most recent and best varieties and lines for testing, indicating that these were the most winter-hardy lines for northern Europe. It didn’t matter–none of them would survive our worst Wisconsin winters, characterized by intermittent or lack of snow cover, strong winds that dried out the plant crowns, and extreme shifts between warm and cold spells during late winter and early spring. In the late 1980s, we began selecting ryegrasses and festuloliums for winter survival. We dug surviving plants from old research plots and on-farm pastures at several locations, crossing the survivors to produce new seed populations and testing those populations and their parent varieties in plot trials to determine the amount of improvement that we had made. The first variety to be developed and released from this selection program was ‘Spring Green’ festulolium. This variety is a selection from hybrids of meadow fescue with perennial ryegrass or Italian ryegrass. We collaborated with Peter Pitts, a livestock producer and entrepreneur near Spring Green, WI and with Pure Seed Testing, Inc. in Hubbard, OR to develop this variety. Spring Green has improved freezing tolerance, measured as plant or tiller survival at -12°F (Table 1). This resulted in improved survival under field conditions. The improvement in survival was greatest at the locations with the most severe winter conditions (USDA hardiness zones 2 through 5). Over 1 million pounds of seed have been sold during the past 5 years, marking the success of this variety. Over 200,000 pounds of certified organic seed was produced in 2004 for the 2005 planting season. 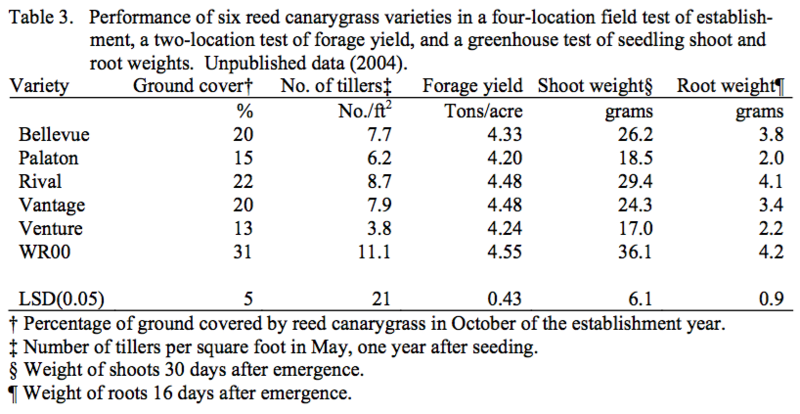 Our first grazing research effort was an on-farm trial of several pasture grass varieties (Casler et al., 1998). This study identified meadow fescue has having untapped potential as a pasture grass for the northern USA. It has forage yields lower than tall fescue, but because its acceptance by dairy cows was considerably higher than tall fescue, consumption was equal for the two species. Meadow fescue comes from the colder regions of northern and eastern Europe, while tall fescue comes from the Mediterranean region. Due to its greater cold tolerance and palatability, meadow fescue is a better choice than tall fescue for the northern USA. Both grasses are highly adapted and tolerant of grazing. We began breeding meadow fescue in the late 1990s, and have developed one new variety that has yet to be named, still going by its experimental name WMF1. We conducted more extensive evaluations of meadow fescue germplasm from all over northern and eastern Europe, selecting a small number of parents for WMF1. 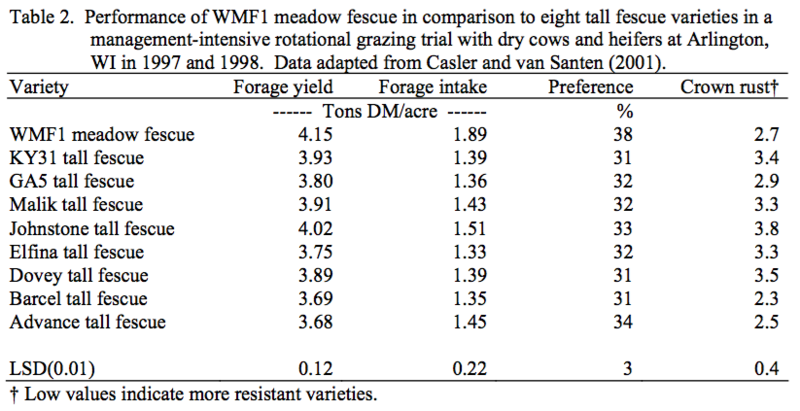 This variety has 8% higher forage yield, 34% higher forage intake, and 20% higher preference under rotational grazing than tall fescue (Table 2). It has crown rust resistance comparable to the best tall fescue varieties. This variety is currently in the seed multiplication phase and will be named and released in 2005 or 2006. Reed canarygrass is a potentially valuable pasture grass that suffers from poor seedling vigor, increasing the length of time required for successful establishment (Casler et al., 1999; Undersander et al., 2001). In 1993, we began a breeding program to improve seedling establishment capacity in reed canarygrass. Our approach was to plant seeds in areas with heavy infestations of annual weeds, allowing the weeds to compete with the reed canarygrass seedlings, but managing the stands as normally recommended for new seedings (occasional clipping to open the canopy to sunlight). increased root weight after 16 days, but the difference in root weight was only observed at this early date, not at the later dates. Therefore, the improvement in establishment capacity of WR00 appears to be due to improved seedling vigor, which occurs largely through increased shoot weights and partly through increased root weights of young seedlings. This variety is currently in the seed multiplication phase and will be named and released in 2005 or 2006. Orchardgrass is a valuable pasture grass in many parts of the northern USA, but it is very difficult to manage in the spring due to early and profuse heading. Some livestock producers have had some success with late-maturing varieties, but seed is not always readily available for all of these varieties. Breeding non-heading orchardgrass varieties would be an alternative that would make orchardgrass more valuable and popular for pastures. A non-heading orchardgrass variety would also have the benefit of fitting better into multiple-species mixtures, which are advantageous for many livestock producers with a range of diverse soil and environmental conditions on the farm. Breeding a non-heading orchardgrass is complicated by the need to produce seed. By definition, lack of heads, means lack of seed. Because there is no other way to propagate orchardgrass economically, we must be able to produce seed. We have found some orchardgrass plants with heading genes that are controlled by winter temperatures–they don’t head following cold winters, but head-out normally after warm winters. We have selected the best of these plants and have sent them to four mild-winter locations in the western USA to check for seed production. If we are able to produce seed on these plants, we will bring them back to Wisconsin and neighboring states to determine the reliability of the non-heading characteristic and identify the environmental conditions that lead to non-heading plants. We are still a few years from variety development, but a 2005 seed crop will go a long way toward determining feasibility of this idea. Casler, M.D., D.J. Undersander, C. Fredericks, D.K. Combs, and J.D. Reed. 1998. An on-farm test of perennial forage grass varieties under management intensive grazing. J. Prod. Agric. 11:92-99. Casler, M.D., and E. van Santen. 2001. Performance of meadow fescue accessions under management intensive grazing. Crop Sci. 41:1946-1953. Casler, M.D., D.C. West, and D.J. Undersander. 1999. Establishment of temperate pasture species by frost seeding. Agron. J. 91:916-921. Undersander, D.J., D.C. West, and M.D. Casler. 2001. Frost-seeding into aging alfalfa stands: sward dynamics and pasture productivity. Agron. J. 93:609-619. Voison, A. 1959. Grass productivity. Island Press, Washington, DC.